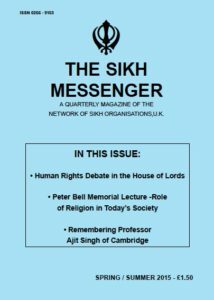 Please see links to the last two editions of The Sikh Messenger in PDF format. Religious literacy, once desirable, has now become absolutely necessary in the smaller world of the 21st century. It can help society in two important ways. You see it when a group of people are chatting together on a street corner or in a pub, and one leaves. Those remaining will almost certainly find something negative to say about the person that has just left, to strengthen their new sense of togetherness. You see the same sort of unity, through negative attitudes to others, on the football terraces in the chants of rival supporters. Shakespeare in Richard the second has John O’Gaunt talking about this precious isle ‘set in a silver sea to guard against infection and the hand of war’, Infection here, does not refer to a disease like BSE but to contamination by foreigners; those different to us. Religions are not immune to similar irrational prejudice against sister faiths. For some, superiority and exclusivity are almost central tenet of belief. In a recent ‘Thought for the Day’ broadcast on Radio 4, I referred to the Sikh teaching, ‘that no one religion has a monopoly of truth’. I received a prompt rap on the knuckles in an email from a Jewish lady, saying I was wrong, because God himself said so in the bible. We all have a right to believe what we like, but it goes wrong when we begin to disparage others to show our superiority. Even today, the dictionary definition of heathen is ‘those not of an Abrahamic faith’- so you can see where that leaves me! We all know that in a fog or mist, familiar everyday objects can assume threatening proportions. It is the same when we allow prejudice to obscure our understanding of different faiths. Prejudice and assumed superiority can all too easy to blind us to important commonalities, and cause us to look negatively at the religious belief and practices of others. The first reason for a need for greater religious literacy, is then, to remove distorting ignorance and assumed superiority and see different religions as they really are: overlapping circles of ethical belief, in which the area of overlap is importantly, far greater than the smaller area of difference. In my Thought for the Day broadcasts, I regularly draw attention to such commonalities. At one time, negative attitudes to others didn’t matter too much. We could refer to those with different faiths in a superior and disparaging way because they lived in far off countries and rarely came into contact with us. This disparaging of distant people perversely enhanced our own sense of cohesiveness. Today in our smaller world, our immediate neighbour is often from some other country having a different faith, and importantly, the same applies to our children’s classmates in school. In the words of a well-known hymn, ‘new occasions teach new duties, time makes ancient good uncouth’. We all need to adjust to a changed world. Countries like the USA and France which pride themselves in a refusal to allow the teaching of religion in schools, are simply allowing children to grow up ignorant of the beliefs of those around them, and easily influenced by the irrational prejudices of their parent’s generation. With ignorance of other faiths being the norm in the States, it’s not surprising that the first person shot in anger at the 9/11 outrage was a Sikh in a case of mistaken identity, and that a Sikh gurdwaras was subsequently attacked and innocent people killed. In comparison to many other countries, Britain has done much in recent years, to teach children about the beliefs of other faiths. But we need to go further. All too often in the teaching of other faiths, the focus is on peripherals rather than the actual ethical teachings. There is still an undue emphasis on rituals and artefacts: on the shape and layout of places of worship and even in radio quiz, the number of arms of a certain Hindu goddess. Such things may be quaint, but they have nothing whatever to do with the ethical teachings of the founders of our different faiths. We see then, that greater religious literacy is not simply desirable, but necessary for true understanding of sister faiths and greater community cohesion. This leads me to the second reason for greater understanding and cooperation; the true role of religion, which, in the Sikh view, is to highlight norms for responsible living. Norms that should influence both individual behaviour and public policy. Parliament spends considerable time and allocates billions of pounds in trying to remedy the effects of careless, selfish and irresponsible living. This is seen in daily reports of neglect of the elderly or infirm and neglect of parental responsibility, leading to children put in supposed care often ending up in as victims of abuse, or drawn towards crime. A report this week revealed that 80,000 children a year suffer from depression unable to cope with the complexities of modern life, with 17,000 attending Accident and Emergency, I could go on. Religions, all religions, in their own way try to teach right, wrong and responsibility; vital ingredients for greater social responsibility. We can make a real difference by working together to make responsible behavior more of a norm, saving the country huge sums addressing the consequences of irresponsible living. Religion then can be a powerful force for good. In today’s increasingly unstable world. If not properly understood, it can, as we see again and again, lead to dangerous conflict and horrendous suffering. To be truly effective, we need to go easy on divisive talk of exclusive and superior special relationships to the one God of all creation, and work together to embed the ethics of the founders of our faiths into more considered policy making, for a fairer and more contented society, and a more peaceful world. Response to questions from the Audience. 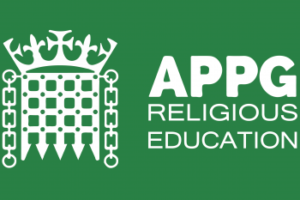 Question: Can greater religious literacy help in the fight against extremism and radicalisation? In 1984 the Indian government attacked the Golden Temple in Amritsar killing well over 1000 pilgrims. In the propaganda of the day, wanton killing of innocents, was an attack on ‘extremists’. Sikhs abroad were outraged. A few months after the attack, I was visited at home by two Scotland Yard Officers, They asked me if I was an ‘extremist’ or a ‘moderate’. I replied I was extremely moderate. Then they asked me if I was a ’fundamentalist’. I paused and replied, ‘I believe in the fundamentals of Sikh teaching such as: the equality and oneness of the human race, a stress on the full equality of women, respect for all religions and a commitment to help the poor and underprivileged. Yes, I am a fundamentalist’. My plea is for clarity in debate so that we can discuss real concerns. Question: Some defend questionable behaviour by saying that it is supported by their scriptures which are ‘the word of God’. Can such attitudes be questioned without giving offence? Reply: Sikhs believe that it is important to question beliefs and practices that appear to demean people or seem contrary to common sense. Guru Nanak and other Sikh Gurus often criticised superstitious or demeaning practices, such as the caste system and the treatment of women in the faiths around them. Scriptures like the Old Testament and the Quran have a substantial historical element that relates to particular circumstances at a particular time, many hundreds of years ago. For example, the Quran accepts slavery in giving advice for their better treatment, but today, slavery itself is widely condemned, and could never be the will of God. Historical texts must be interpreted in the context of a particular time. To me as a Sikh it is, to say the least, wrong to blame God for ungodly behaviour.